Pantone Solid Colors have a variety of colors in the form of a glossy finish with a coated layer on the top of each page of the guide and in the direct printing on high-quality paper without a coated layer called the uncoated guide or the uncoated chip book. Pantone coated guide and the pantone uncoated guide are sold as a complete set in the product called the Pantone Formula Guide. This Pantone Formula guide contains all the Pantone solid colors in the form of a fan-shaped chart which is quite handy and portable. There were 112 new solid colours introduced in this product in 2015. If the user has several purposes with the same guide or if several people wish to use the solid colors in the same factory, it is recommended to purchase the Pantone Solid Chips Book which contains all the Pantone solid colors in the chip format and is a multi-purpose book. This Solid chip book has several chips of the same color and can be torn out easily as all the chips are presented in the same row. Availability: In Stock, Ready to Dispatch. 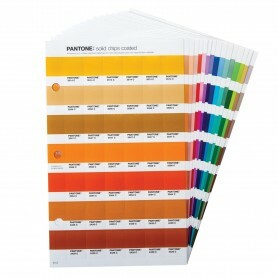 Pantone Solid Colors Book - Coated & Uncoated 4.90 out of 5 based on 6457 user ratings.